India – India vs England 4th Test Day 1 Southampton: Virat Kohli-led team India will be a confident team going into the Southampton Test, considering the manner in which India beat England at Nottingham. India vs England 4th Test Day 1 Southampton: Virat Kohli-led team India will be a confident team going into the Southampton Test, considering the manner in which India beat England at Nottingham. India won by 203 runs at Nottingham to stay afloat in the ongoing five-match Test series. But it seems fans realise that with momentum on their side, the visiting team is deadly dangerous come Southampton. 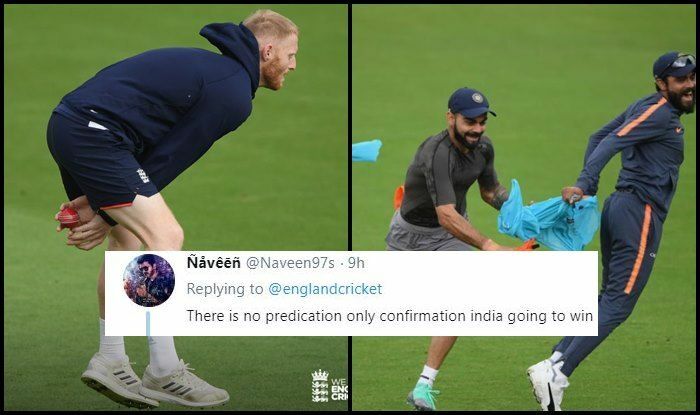 England Cricket Twitter handle posted a question, where they asked fans for their predictions for the Southampton Test. England playing XI vs India for the 4th Test in Southampton:Alastair Cook, Keaton Jennings, Joe Root (c), Jonny Bairstow, Ben Stokes, Jos Buttler (w), Moeen Ali, Sam Curran, Adil Rashid, Stuart Broad, James Anderson.